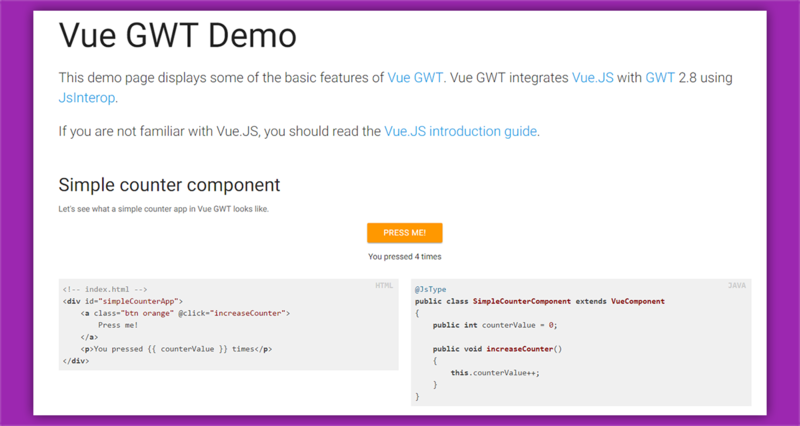 A small example has been posted on the GWTNews Blog, regarding integration of Vue for Google Web Toolkit v2.8. Vue GWT integrates Vue.JS with GWT 2.8 using JsInterop. It let you write Vue.JS components in Java. Visiting the newly created vue-gwt repo will give you an idea of how this project is structured and how to get started. Then you can visit the Demo pages where some counter-components and TodOs examples are presented. Vue GWT Demo page. Vue GWT is in an experimental state. The syntax is not final and might change between versions. It may also contain bugs. It's still a work in progress.